Gartner Group analysts are telling business users that they should look at Windows 7 as an “all but inevitable” Windows release. 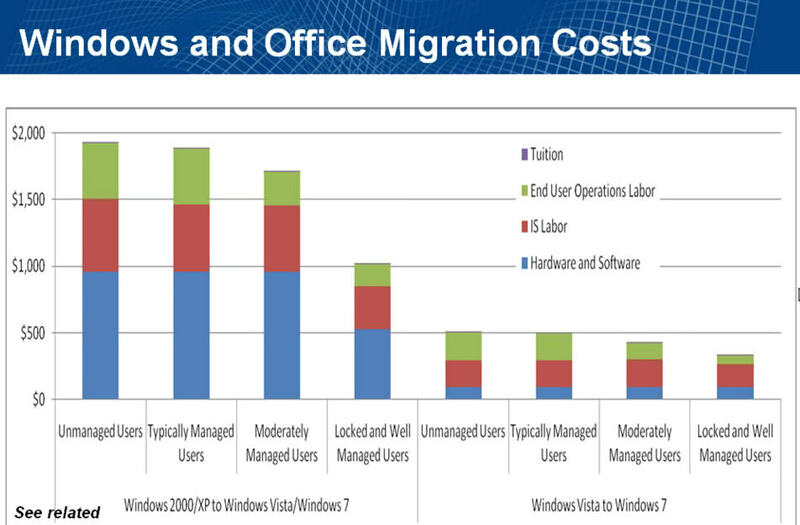 Because “typically more than half of an organization’s applications still require Windows,” said Gartner researchers during an October 13 Webcast for Gartner clients and others, replacing Windows is not a short-term option. Gartner analysts Michael Silver and Stephen Kleynhans shared these opinions and more during an hour focused on providing business users with guidance about Windows 7 features, licensing and deployment. * Windows 7 is not a major architectural release; it’s a polishing of Windows Vista. Still, for businesses, there are “good things to be had” in Windows 7, including AppLocker, BitLocker to Go, BrancheCache, better User Account Control settings, an updated user interface and support for HomeGroups. * Business users should be cognizant of the downgrade/upgrade gotchas around Windows 7. For users who don’t have Software Assurance (SA) contracts, Microsoft’s limits on downgrades to XP (18 months from Windows 7’s release or until the time Windows 7 Service Pack (SP) 1 is released — whichever is earlier) could be problematic. If you don’t have SA and don’t purchase new PCs with a Windows 7 license within this window, you could end up paying $120 to $200 per PC for an upgrade license if you aren’t ready to deploy Windows 7 right off the bat. * While Windows XP’s extended support phase doesn’t end until 2014, third-party application support for a new operating system typically begins to wane two years after the end of mainstream support. This means the XP “danger zone” is 2013 and beyond. * There’s no need to wait for Windows 7 SP1 before starting to plan and test Windows 7. Because Microsoft releases most fixes and updates regularly over Windows Update/Automatic Update, there’s no need to wait for SP1, which is basically a rollup of all these fixes. Microsoft officials aren’t saying when they are planning to release SP1 for Windows 7, but Gartner is calculating it’ll be some time in mid-2010, according to their charts. Unlike consumers, businesses have not been early adopters of 64-bit Windows releases. Gartner’s online poll regarding business plans for 64-bit versions of Windows 7 found 34 percent still planning to stick with 32-bit Windows 7 and 25 percent undecided, but learning toward 32-bit. Another 28 percent of those polled said they were undecided, but leaning toward a 64-bit Windows 7 variant, and 13 percent saying they planning to go primarily 64-bit. Gartner’s analysts noted that 64-bit does proide more address space and access to more physical RAM, but offered users “no major benefit changes,” as well as possible lack of availability of security, VPN and other applications/services. Many large enterprise customers still rely on Gartner for guidance. What do you think of the firm’s advice on Windows 7?